Creamy….alfredo…low calorie? No need to pinch to yourself, no you’re not dreaming. That delicious plate that you’re currently looking at? It’s all real, all healthy, and all delish! Since I started this new healthier lifestyle, one of the foods that I was most concerned about leaving behind was pasta…more specifically, fettucine alfredo. I mean, nothing quite sums up a long, hard earned day like eating a huge bowl of pasta at 2pm, am I right?! Unfortunately, I seem to have a little trend going on here… it seems to be that the foods nearest and dearest to my heart are also the ones that are nearest and dearest to my love handles. With all of that heavy cream and melty cheese, the calories add up at an astronomical rate. I will never forget the day that I decided to actually get a little idea of how many calories my yummy bowl of Olive Garden chicken alfredo contained. I remember thinking…”okay I know I’m going to eat a light dinner anyway but how many calories has this set me back…400? maybe 600? okay 650 at the most”. You can just imagine the look on my face when I saw a whopping 1480 CALORIES. I damn near fell off my chair. I literally sat there, staring at my empty plate, alfredo sauce stain on my shirt, contemplating life. I had just eaten my entire day’s worth of calories (and then some) in one….meal. Since then, I’ve been on the hunt for a healthier substitute that won’t leave me scared to step on the scale but most importantly, will still taste absolutely delicious. 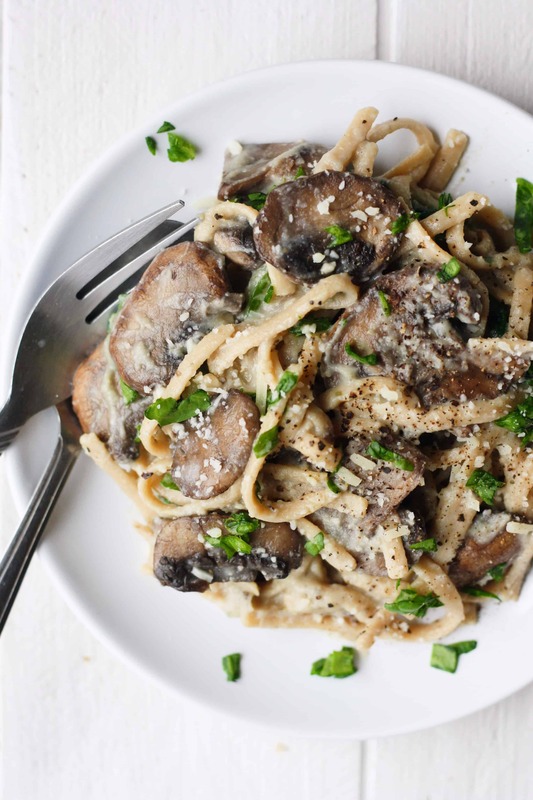 Behold…this 310 calorie Spinach Mushroom Fettucine. No, don’t worry I didn’t forget that extra 0 … it’s literally under 350 calories. You see, the secret to this being so low calorie mainly lies in the sauce, which is made primarily from cauliflower. If you remember my spinach artichoke low carb pizza recipe then you’ll notice how cauliflower is pretty darn awesome at doing this thing where it says “hey, need a healthier substitute? Want it to still taste yummy? I’ve gotcha back.” This cauliflower sauce is super creamy and has a nice garlicy, parmesany (are these even words?) kick to it. So go ahead, grab your blender, handful of ingredients and giant appetite because you deserve this yumminess in your life. Fill medium pot with water and bring to a boil. Add cauliflower chunks and cook until cauliflower is very soft, approx 20 minutes. Fill a separate pot with water and cook fettucine until desired texture. Transfer cauliflower to a food processor or high powered blender, add almond milk, vegetable broth, 2 cloves of garlic and shredded Parmesan. Blend until sauce is a very smooth and creamy consistency. In a large saucepan, melt margarine and cook mushrooms and minced garlic on medium heat until mushrooms are browned and tender. Add cauliflower sauce, spinach and seasonings. Drain pasta and toss into the sauce, coating evenly. Continue to cook on low heat for additional 5 minutes. Enjoy! I have just recently found your site!!! This is such an amazing place and I want to say THANK YOU for all the hard work...the recipes, the pictures, the descriptions. AWESOME!! Cudos to you for all of this yumminess on one site. So, this is recipe #2 from your website and it was absolutely delicious! thankyou for the delicious dinner! Is this based on a 1 cup serving?